Who Are Punch and Judy? Punch & Judy... Isn't that an English puppet show? Anyone familiar with British popular culture knows that the Punch and Judy Show has been a staple of English entertainment for hundreds of years. What many do not know is that Mr. Punch's influence extends far beyond England's shores. Versions of Mr. Punch and his raucous comedy appear in countries around the world. He is known as Pulcinella in Italy, Guignol and Polichinelle in France, Kasperl in Germany, Casper in Sweden, Karagioz in Turkey, Karagiosis in Greece, Petruk in Indonesia, to name a few. Each of these countries has a living, vibrant tradition of Punch and Judy-like puppetry which in some cases pre-dates the British version. Mr. Punch's earliest roots date back to the wandering Commedia dell' Arte troupes of 14th century Italy. Pulcinella, a hook-nosed, cowardly buffoon, was a popular character in the comic plays of these actors. During succeeding centuries, Commedia plays spread to France and then England. There the Pulcinella character merged with British glove puppet traditions to become Punchinello, or Mr. Punch. Punch acquired a wife (originally known as Joan), and by the end of the late 17th century, the Punch and Judy show was firmly ensconced in the annals of tradition. In May of 1662 at London's Covent Garden, the famed diarist Samuel Pepys observed a Punch & Judy Show performed by an Italian Punchman named Signor Bologna. Pepys described the event in his diary: "...an Italian puppet play, that is within the rails there, which is very pretty, the best that I ever saw, and great resort of gallants." This event is considered the first written record of a Punch and Judy performance. A plaque in Covent Garden commemorates the event and can be seen today. By the mid-1800's, the Punch and Judy Show had entered its Golden Age. Nomadic Punchmen performed at country fairs, seaside resorts, family parlors and the streets of London. Audiences included poor people of the streets, as well as the rich and fashionable upper crust. Several writers of this era paid homage to Mr. Punch. In the 1840's, Henry Mayhew interviewed an itinerant Punch performer and published the result in Mayhew's enormous work, London Labour and the London Poor. The interview offers a wealth of insight into the culture of 19th century Punch performers. Many of these performers came from three or four generations of Punchmen. Tradition was of the utmost importance to these puppeteers; they even developed their own language. Payne Collier was another writer enamored with Mr. Punch's antics. He transcribed a Punch performance and published the account (which, according to modern Punch performers, is somewhat lacking in accuracy.) George Cruikshank illustrated Collier's text. This book is the first published transcription of a Punch and Judy script. Cruikshank's illustrations have become classics. Charles Dickens was also a great admirer of the Punch and Judy Show. Mr. Punch is frequently mentioned in his novels. One work, The Old Curiosity Shop, seems to be based almost entirely on the Punch tradition. Tastes and times change, but the Punch tradition has survived through many centuries. Today the Punch and Judy Show is experiencing a revival in Britain and the United States. The show has never been more colorful or beautifully performed. We hope that the Worldwide Friends of Punch and Judy will help ensure that Punch will always be appreciated for his unique role in history. Audiences, performers, historians, scholars. These are the admirers of Punch. Punch and his relatives delight audiences around the world, young and old alike. In this electronics-dominated 21st century, children rarely have a chance to see live, three-dimensional theater. The Punch and Judy Show provides that opportunity, and children are entranced by it. Punch's world is raucous, silly, and beautiful to look at, full of adventure and laughter — a world children love to inhabit! The pleasures of the Punch and Judy Show are not only alluring to those watching in the audience. The view from inside the puppet stage is equally compelling. Punch performers, or "professors," as they are called, are completely enamored of the characters whom they bring to life. And their dedication to the demands of their craft is absolute. Tradition, history, performance skills passed from master to student — all of these are very important to a Punch professor, and indeed, to puppetry scholars in general. Some people worry that the Punch and Judy Show, with its "knockabout" humor, may incite children to violence. Punch professors know this isn't so. Having watched thousands of children enjoy Mr. Punch's antics, performers have seen first-hand that children do not emulate Punch's bad behavior. In fact, the opposite is true. While watching the show, children blithely take on the role of the principled parent who scolds the bad child, Punch. When Punch denies his misdeeds, the children shout out "Oh, yes you did!" They are very vigilant and serious (in a silly sort of way) about catching Punch in the act of mischief-making. They scrutinize Punch's behavior with the dedication of the most righteous moralist, and they have a marvelous time making sure Punch doesn't get away with anything. The Worldwide Friends of Punch and Judy is the brain child of Glyn Edwards, a respected British Punchman. In Britain there are two professional Punch organizations: The Punch and Judy Fellowship, and the Punch and Judy College of Professors. These are wonderful organizations, but they are not open to the public. "And so," as Glyn says, "an idea was born. Why not give Mr. Punch a journal all to himself, for fans as well as performers, and make it available worldwide?" To accomplish this goal, The Worldwide Friends of Punch and Judy was brought into being. The journal, published only on the Internet, is called Around the World With Mr. Punch. The publication provides insight into all facets, both historical and modern, of the Punch and Judy Show. Glyn Edwards (UK) is its Editor, and Diane Rains (aka Professor Freshwater) (USA) serves as Online Editor. 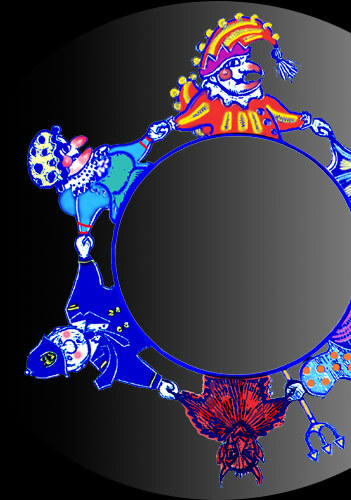 Around the World With Mr. Punch is published on a private web site. Members of The Worldwide Friends of Punch and Judy are sent each new issue's URL via e-mail. Joining the organization is easy; one need only e-mail Professor Freshwater and ask to be added to the subscription list. Membership in The Worldwide Friends of Punch and Judy is free and is open to anyone and everyone. What are this group's aims? To let members share their common enthusiasm and to exchange information around the world on all aspects of the Punch and Judy tradition. To lend support to the tradition where it exists outside the United Kingdom, and to foster an appreciation of Mr. Punch in countries where he is not as familiar as he is in Britain. The organization furthers these aims through the pages of Around The World With Mr. Punch. Also, members in each participating country organize locally whatever they wish in pursuit of these aims. For example, in August of 1999 the Worldwide Friends participated in a Punch Faire at the Puppeteers of America's National Festival in Seattle. Dozens of Punch professors performed, some of whom had traveled thousands of miles to reach the event. The Punchline, a database of North American Punch and Judy performers of the 19th and 20th centuries, was displayed on a 40 foot long clothesline.